The international hunt for Jesus has ended with an appearance on the staged CIA set of the Ellen Show. Here is how you control the narrative and on the Ellen we only ask soft touchy feely questions about how you feel and it must have been awful that whole shooting thing. Those are the types of questions you would expect from the Ellen Show and she did not disappoint. There a few problems with this narrative that the Deep State CIA/FBI/Soros Cabal is trying to hoodwink the sleeping American population with. If this Narrative is allowed to stick and becomes the Official story then we are lost as a species. Because if you cannot see through the lies when they are this blatant and this obvious then the FEMA Camps that are in waiting for Peaceful Inhabiltants will be super easy to fill with full compliance. Where is your BodyCam footage from that night Jesus Campos? Why has the Sheriff not released as CCTV video Footage from that night? Why would someone be using a Jackhammer at 10pm at night on the 32nd floor? Is this supposed Engineer an actual Engineer registered in the State of Nevada? Why was Paddock drilling into the walls? Are you an actual Security Guard with the State of Nevada? Why is there no registration for a Security Guard under your name? Is Jesus Campos your real name or just an alias? Where is the Leg wound evidence? What time did you call in the shooting? Why did you cancel the interview with Hannity and choose Ellen instead? Why are you not going to answer any more questions? 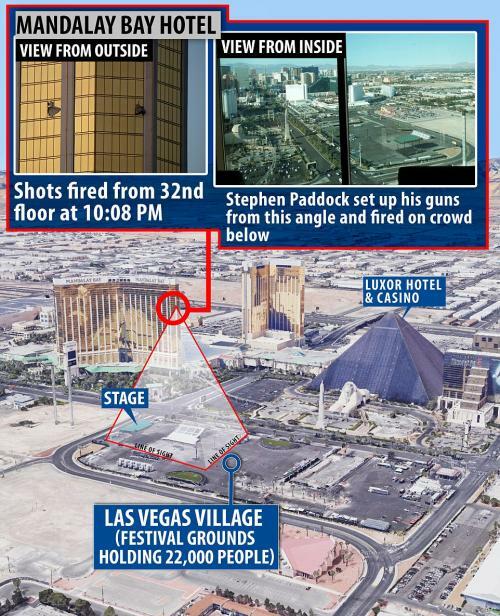 Why was Paddock even shooting at you? Were you going to Paddock’s room to check about the Loud Music complaint? We are sure the Citizen Journalists out there that are part of the Real Investigation could add a few more relevant questions to this list. Please comment away. Engineer Schuck, responding to Campos’ earlier call about a blocked door, arrived on a service elevator from a higher floor, and he spotted Campos at the end of a hallway. It was quiet as Schuck walked toward Paddock’s end of the hallway. Then he saw Campos and heard gunshots. “At the time I didn’t know it was shooting; I thought it was a jackhammer,” Schuck said. According to the Nevada State Board of Professional Engineers and Land Surveyors website there is no such person registered there as Stephen Schuck who is registered as an Engineer. How about as a Building Engineer? Because in some instances they need to be registered at the State or City/County Level. Our records search could not find any public records for Stephen Schuck at Clark County and/or State of Nevada. What is even more bizzare is there is a Campos registered as an Engineer in Las Vegas of all places. No record of Campos as a Security Guard, but there is a record of an Engineer? Is the CIA mixing up profiles here? Hu is on First? Watt is on Second? Has the CIA left the stage and gone to their underground bunkers and left the absolute amateurs at the helm after JadeHelm15? Which scenario is more scary for Humanity?